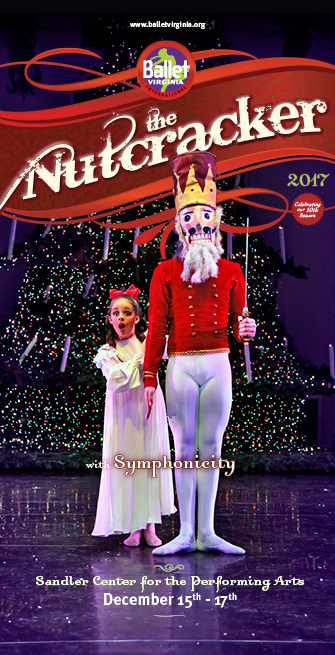 This summer, I poured over thousand of photos (thank you Tom Gorman) looking for the photo to represent this season’s Nutcracker. There were several good choices but this one of “Clara”, Maya Markova Livni and “Nutcracker” Leo Ameika, seemed to capture a lot of what is so magical about “The Nutcracker”. You can see Maya’s natural acting abilities captured in the photo and Leo is one of those rare humans who actually looks good in white tights. We are very proud of both of these “home-grown” local dancers! After selecting the photo, I sent it to Patrick McCarty at Evolv Design, who made it look polished and beautiful with all the information needed. We are lucky to have such a talented team of creative people. So, here is BVI’s 10th Anniversay Nutcracker image. You can get tickets at the Sandler Box Office or by clicking HERE. Pre-register here or come early to the audition to fill out a form. Click here for all the details on fees and times. Make a good first impression at the audition by being sure you look the part. Be prepared with the appropriate clothes and shoes, please wear a solid color leotard, pink tights and pink ballet slippers for the girls and a white t-shirt, black tights and black ballet slippers for the boys. If you are currently enrolled a BVI, its helps us if you wear your academy level color leotard. If you are on pointe, bring your pointe shoes with you. You may or may not wear them but be ready just in case. Try your best. Show us you’ll listen and take corrections well. Remember that when auditioning for a ballet, getting a certain role involves many factors including your technical ability, performance qualities and if you fit part. We’ve all done it. Not only are you watching yourself in the mirror, but you’re also looking at the dancer on your left and thinking your arabesque isn’t as high as hers, and looking to your right and thinking her lines are longer and cleaner than yours. Try not to get caught up in comparisons. Keep your focus on yourself and doing your personal best. Your qualities and strengths might be exactly what we’re looking for. We are looking for hard-working dancers with positive attitudes not perfection. If you make a mistake, don’t get stuck on it. Move on with a smile on your face and show us you recover quickly. This is the second in a series of blogs about Coppélia by Lisa McCarty. Ballet Virginia International is currently in the early stages of production for Coppélia and very much looking forward to bringing this fun classic to the Sandler Center for the Performing Arts on Saturday, April 8th, 2017. Coppélia is a well-known ballet and is found in the repertoire of many professional ballets throughout the world. It’s a bit unusual for a classical ballet because, unlike so many of them, it is a comic ballet. Yes, that’s right, a ballet with lots of funny bits! It was originally choreographed by Arthur Saint-Leon with music by Leo Delibes. The libretto is by Charles Nuitter. Nuitter’s libretto and stage design was based upon two stories by E.T.A Hoffman, The Sandman and Die Puppe (The Doll). Another one of Hoffman’s stories (as you may know) was used as the story for The Nutcracker. Coppélia premiered in May of 1870 at the Théâtre Impérial l’Opéra in Paris, with the 16-year-old Giuseppina Bozzacchi in the principal role of Swanhilde. It eventually became one of the most performed ballets at the Opera. Modern-day productions are usually derived from the revivals staged by Marius Petipa who also choreographed Don Quixote, La Bayadère and The Sleeping Beauty to name a few. Petipa did this with the Imperial Ballet of St. Petersburg in the late 19th century. Petipa’s choreography was documented with choreographic notatation at the turn of the 20th century. These notations were later used to stage the St. Petersburg version for such companies as the Vic-Wells Ballet (precursor of today’s Royal Ballet). In the twentieth century George Balchine’s version of Coppélia was touted as “THE HAPPIEST BALLET ON EARTH!”. Now in its third century of performances, it is regarded as an audience favorite and timeless classic. This is the first in a series of blogs about Coppélia by Lisa McCarty. 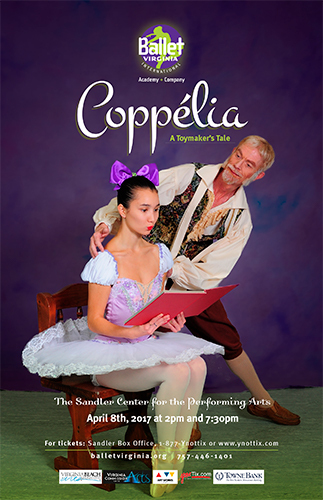 Ballet Virginia International is currently in the early stages of production for Coppélia and very much looking forward to bringing this fun classic to the Sandler Center for the Performing Arts on Saturday, April 8th, 2017.